In 2016, the C&O Canal Trust embarked on a mission to ensure the C&O Canal National Historical Park would be relevant and cared for in future generations. 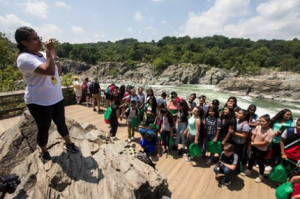 Called the “Canal For All” initiative, the program sought to develop lasting, balanced partnerships with African American and Latino communities in Montgomery County, MD, where 38 percent of the population are Hispanic or African American. Thanks to the generous support of the National Environmental Education Foundation (NEEF) and the Kendeda Fund, the Trust just wrapped up a two-year pilot of the Canal For All initiative, which launched the program and provided the capacity for robust and sustainable partnerships and programming in the years to come. Overall, 385 participants were engaged through 13 events, and 21 volunteers were trained to deliver the Canal For All programs. The Trust began by integrating community groups into our existing programming, bringing youth groups to the C&O Canal from Community Bridges, Identity, Inc., the Latin American Youth Center, and the Bethesda YMCA Horizons Outdoor Adventure Program to participate in Canal Pride clean-ups, overnight stays at our Canal Quarters lockhouses, bike rides, hikes, and rock climbing workshops. L.L. Bean provided recreational “Camping 101” and “Choose Your Own Adventure” clinics, while park rangers gave educational lectures and the Bike Loaner Program provided bikes for towpath rides. The initiative also included cultural competency training for the C&O Canal staff and volunteers and the translation of Canal Quarters printed interpretive content into Spanish. Phase II of Canal For All is now underway and will continue to build on the successes of the past two years. Thanks to funding from the Montgomery County Council, we will begin a Conservation Jobs Corps program for disadvantaged youth during the summer of 2019, as well as continuing programming with our current partners and the recruitment of new partners to the program.